–Do not rely on Mapquest for directions to the track (Mapquest didn’t provide an exit number, and the state highway route number was wrong). –Do not, under any circumstances, miss the exit off the Atlantic City Expressway (you have to go an additional ten miles before you can turn around, and you have to pay $4 in tolls in order to do so). –I am not very good at handicapping turf races full of horses who have never run on turf. OK, that last one is a bit of an overstatement, but pretty much every race (all six of them) had plenty of horses who had never raced on turf. Unknown trainers, little-known jockeys, and surface confusion: yup, you’re right, didn’t cash a ticket. Came close a couple of times, though. Logistical and gaming frustrations aside, what a delightful way to spend a warm and sunny spring afternoon. The weather was gorgeous, and a crowd of 3,500 very enthusiastic fans showed up to enjoy one of the six racing days this track will see this year. As an Aqueduct habituée, I am used to decrepit physical plants; ACRC is less decrepit than…temporary. 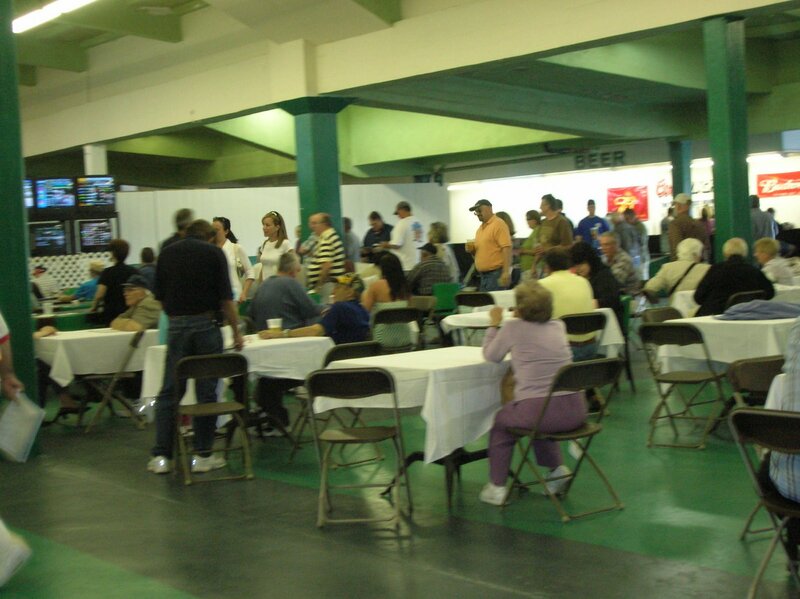 The ground floor of the grandstand offered plenty of seating in the way of folding tables and chairs set up throughout, and at least one of the snack bars was a fundraiser for a local organization (a school? ), with participants selling pretzels and bags of candy. The tote board was barricaded (to keep out homeless people, I was told by a local journalist), and apparently the boards were an improvement upon last year, when so many of the lights weren’t working that the board wasn’t much help. With odds posted nowhere on the grounds, we would watch the horses in the lovely walking ring, walk back inside to check the odds on the television, bet, go outside to watch the race, and go back inside to see on the television what the prices might be. Thursday, four of the six winners paid between $8 and $8.60; the other two paid $9.80 and $12. 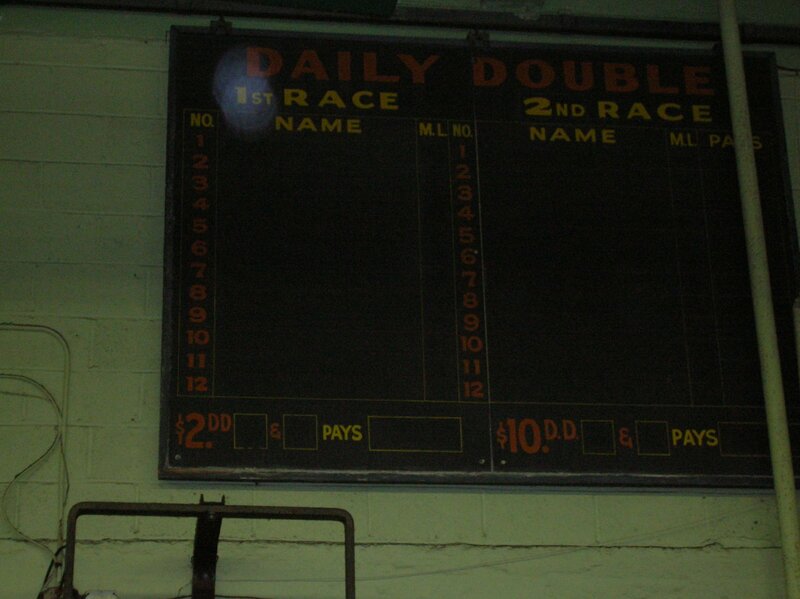 The only multi-race wager was the double on the first and second races. Apparently Wednesday’s card offered a double on the last two races, but that was not the case yesterday. The races seemed competitive in an, um, uncompetitive sort of way. Not a lot of entries to really get excited about, except for a Graham Motion first time starter by Empire Maker in the finale who obligingly won and more than obligingly paid $8 after being 2 – 1 on the morning line. Rather astonishingly, the post time favorite was a three year old colt by Black Tie Affair (sire of Evening Attire) who was 10 – 1 on the morning line and who finished next to last by about twenty. The horse who finished behind him last raced in August of last year and whose last published work was a week before that start. He was eased on the backstretch and jogged home. The third place finisher in this race was an eight year old who was a regular on the New York circuit; two races back, Erudite finished third in a maiden special weight in Saratoga…and that race was in, um, September of 2004. He raced once after that, ten days later at Delaware, and took the next three and a half years off. His third place finish was decent, and maybe he just needed the race? My favorite horse of the day was Salle de Bain, a three year old Sky Mesa filly who was claimed from Bill Mott’s barn (Desormeaux was her rider) in January. She’s been racing at Gulfstream and broke her maiden in her seventh start; she finished a decent third and I wonder where she’ll turn up next. When I visited Tampa Bay Downs in January, I wrote, “Florida schools were still on holiday break while I was there, and there were a number of families and kids at the track: little kids with their parents, teenagers out for the day.” There was a similar vibe at ACRC; many public schools are closed this week, and there were people of all ages and both sexes at the track, including a lot of grandmotherly-looking sorts, which I don’t often see at Aqueduct—or Saratoga, for that matter. People were really having a good time betting, hanging out, sitting in the sun. If I’d ever been to one of those country fair meets, I’d say that this felt like that…but I haven’t. It’s what I imagine, though. There’s a sense that these few racing days are precious to the local folks, that fans make an effort to get out and support their track, to enjoy it while they can. Atlantic City Race Course’s death knell has been sounded many times, and the politics and finances of New Jersey horseracing are more than I can possibly absorb or relate, but all accounts indicate that the days of this track are numbered. It’s hard to see why, though, it can’t continue to sustain a week, or a couple of weeks, of racing in the spring. Most of the place is in decent shape, and it would be great for it to continue to be a racing destination for folks within a couple hours’ drive…it would be a shame, I think, for any more of the place to look like this. The best way to get ACRC going again (a worthwhile endeavor, by the way) is to get the casinos involved. Atlantic City is facing gambling competition from all over, and like Las Vegas did 10 or 15 years ago, A.C. is going to have to become more of a destiation, offer more than just run-of-the-mill gambling, to stay economically viable. A couple of boutique meets, two or three weeks apiece, one in spring or early summer (between Keeneland and Saratoga/Del Mar) and one in the fall (late September/early October, situated as a prep for the Breeders Cup) would be definite attractions, and would give Atlantic City another reason for people to visit. It’ll never happen, of course, but it could work, especially if the casinos viewed the track as an asset to them, and not a threat. Nice post, I’ve been curious about ACRC. At least you got to see my client’s horse win in the 5th against the horse you liked..no simulcast!Go Chris Drury! Great post! 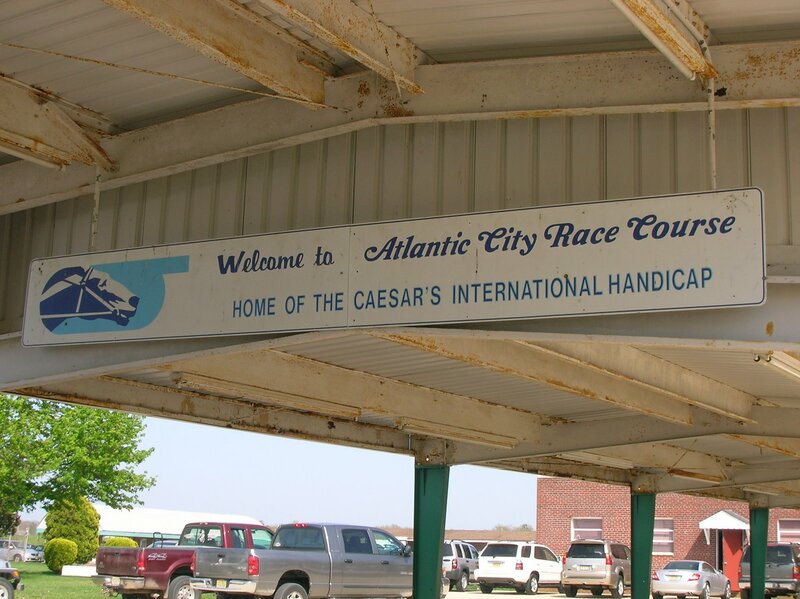 I was lucky enough to work at AC during its last long meeting that featured the Caesar’s International captured by Influent.It’s sad to see such a grand old track slipping away, especially when local fan interest could support a short race meeting and Greenwood has the funds to refurbish at least some part of the racing plant. Get the casinos involved by contributing money. Personally, I’d like to see them put in some slots. It can flourish, but greenwood won’t spend a dime until they have a chance at making a return on investment, nor would any rational business. The short meet looks good, but doesn’t make any significant cash. They run it with the Philly Park staff on their dark days, they work 7 day weeks. They can’t do it long and they cant’ justify a separate staff. I would love to see this track resurected, but it’s not going to happen without direct state intervention. Thanks for the great comments, everyone–this track seems to have so much passionate support, it would be a terrible shame if it were to actually close. It certainly seems like they can draw a crowd for a short meet.Geno: I found out at Pimlico that M.E.’s Smile is trained by the same woman who trains the horse of a friend of mine. Wish you guys would have filled me in BEFORE the race!And let’s not talk about the Rangers, OK? How great to stuble upon this post. 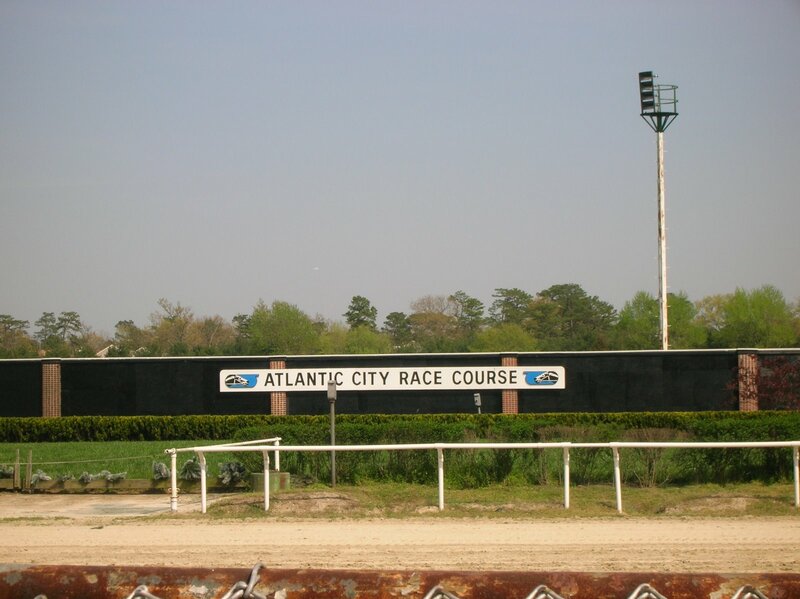 I grew up going to Atlantic City in the 80’s and 90’s…most of the riding community I was a part of were involved in one way or another as trainers or boarding stables…our farm had an awesome 1/2 mile training track. It was always such a great time going for the summer evening meets, going to the backside in the mornings with my friend’s father. 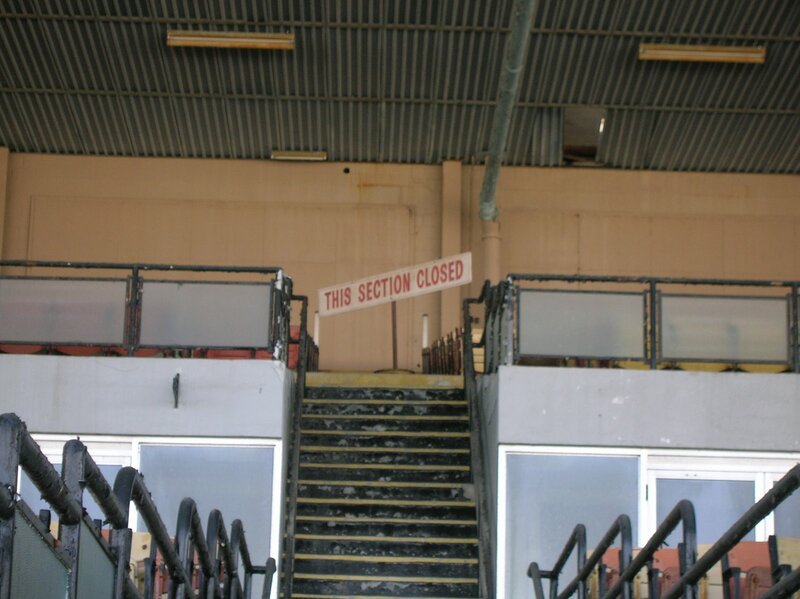 I would hate to see it close for good, it’s such a grand old track. Although I couldn’t make it back this year, I would without a doubt try to get down next year and for a longer “short” meet. Great post, great track! I grew up down the road from this track, and it was a great place to go. Clear summer nights were the best. Grab a table outside the walking ring, grab some hand-made burgers and beers, then head to the rail to watch the races. I’ll never forget those times, and make the 1.5 hour trek from DE every year for one of the short meet cards. I also believe this track can be saved. Why can’t it run when Monmouth or Meadowlands are dark? With the influx of big purses at other tracks, thy can run with smaller purses for cheaper claiming prices, and get nice fields (ie Beulah, Turf Paradise, Finger Lakes, etc) I also agree that the casinos should get involved, especially with how they are failing. Having a slot parlor 40 minutes closer would help draw those headed to Philadelphia Park. I think Greenwood has something up its sleeve to save the old lady. I’ll be there for that. Only 2 weeks until the 2009 meet begins. 6 days of racing on Thursdays and Fridays for 3 consecutive weeks. The greatest place to see all turf racing in the northeast. This place throws a lot of next out winners and seeing them live is a must.